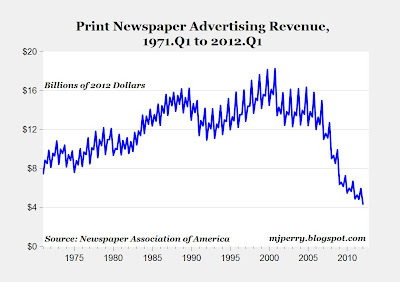 The Newspaper Association of America (NAA) recently released data on newspaper advertising revenue for the first quarter of 2012, and the steep decline continues (see chart above). Total print advertising in U.S. newspapers dropped to $4.36 billion from January to March, which was 8.2% below the same period last year, and fell to the lowest level of advertising revenue since the third quarter of 1982. 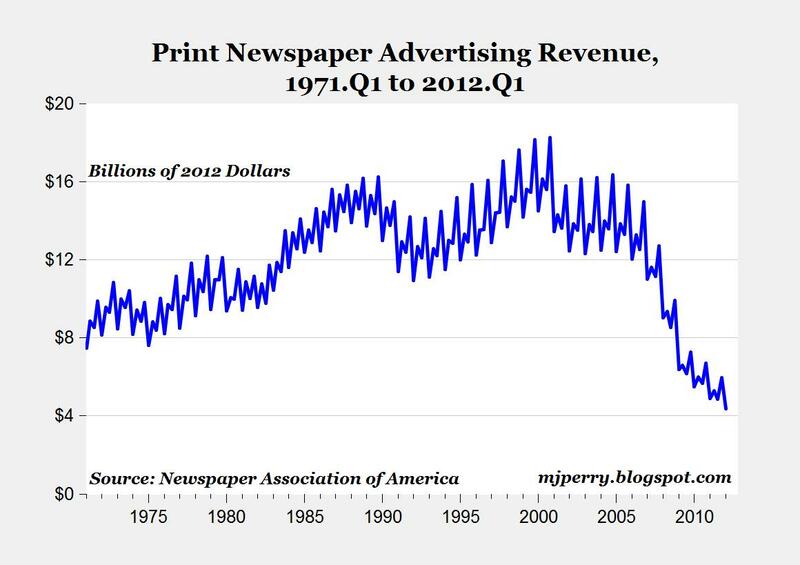 Adjusted for inflation, the advertising expenditures in the first quarter reached the lowest level since the NAA started tracking quarterly advertising expenditures in America's newspapers back in 1971. Compared to the peak of $18.26 billion (in 2012 dollars) in 2000, advertising revenues have fallen by more than 75%, and appear to be on a sharp downward trajectory. "Unlike the tech bubble, the newspaper bubble won’t come back because it can’t. Many of the businesses that once supported newspapers with ads don’t exist on the same level anymore (such as competing department stores and grocery stores) or have found better places to put their ad dollars (the Web, television and Craigslist) or have discovered that they don’t need to spend ad dollars anymore to sell their goods and services (Craigslist again). The expired bubble won’t take all newspapers down with it immediately. One theory (pdf) gaining currency is that because the current generation of print newspaper readers isn’t being replaced, major U.S. print dailies will be dead in five years with only small-town newspapers and the national dailies surviving." It makes sense. Most newspapers are totally useless and have an agenda that they are pushing. As readers find alternate sources that offer better services we expect most of the old print media to go under. Is this only the ad revenue from paper editions, or revenue from online ads at the websites of the New York Times, etc? If the latter, then that is a shock. If the former, I am surprised it took so long.. The link to the NAA website is fixed, and the data in the graph are for print edition ad revenue only. The NAA website also reports online advertising, which has been growing a little bit, but not much, e.g. 1% in Q1. About time. I was out of town over the weekend. I bought a Tyler, Dallas and Houston newspaper. I read them front-to-back, which only reinforced my decision to stop reading newspapers years ago. The NAA website reports that subscription, what they call "circulation," revenue has been flat at $10 billion/year (nominal dollars) since 1996. That means it's been going down in inflation-adjusted dollars, but not quite the collapse in ad revenue we're seeing this decade. Soon, newspapers will make more from subscription revenue than ad revenue, and if they're smart they will embrace that paid model again and push it for all it's worth, as the Economist and WSJ have profitably done with their paid online editions for years, and delay their doom by a decade or two. However, nobody ever accused newspaper industry executives of being smart and forward-thinking, ;) so I suspect that 5 years till extinction is a better estimate. Note that they're doomed either way, as online media is a fundamentally different and constantly mutating medium that the old-line media can never hope to wrap their heads around, but they can prop themselves up for a bit longer if they well and truly embrace subscription models. I suspect they won't. "What did Thomson know that the other newspaper operators didn’t? Perhaps nothing, except for using a cold eye to look at its profit margins. In a brilliant feature about the company written by William Prochnau and published in the October 1998 American Journalism Review, we learn that Thomson’s newspaper profit margins fell steadily from 33.9 percent in 1987 to 17.6 percent in 1997. Thomson, which was as good as any company at extracting high margins out of its newspapers, wisely read the data as a market directive to escape the bubble and get out of newspapers." dont disagree, but 'bubble' is an odd word to use to describe print journalism, dont you think? If there's a bubble to deflate, doesn't that suggest that Obama would give the newspapers a bailout during his second term, if he has one? Paywalls for newspapers might stop the decline of circulation. In fact, the New York Times is finding success in paywalling for its on-line "all the news that's fit to print". On-line editions of newspapers are a work in progress, but the NYT success brings hope for news providers. Gee, provide free content and they will come. Stop giving it away and they might still come with $$. BTW, the biggest purchaser of newspapers lately is Warren Buffett. Newspapers have bad content. Their fixation with cutting labor costs has led to decreased coverage of important local sports and business news. They prefer to purchase their product from national vendors and ignore the information wanted by their subscribers, insisting on profit margins that don't exist for other businesses. Too bad. Businesses that fail to adapt deserve to become extinct. I've read that tiny local newspapers are thriving. As I understand it, they mostly report high school sports, local political news. obituaries, and police reports. These suburban and small town papers usually publish once a week, and often distributed free. Small business advertising seems to be a huge revenue source for them. As many small towns and suburbs are conservative, I wonder why columns of right-wing journalists aren't carried n these small papers. Perhaps the syndicated journalists have exclusivity clauses in their contracts. Jet: "I've read that tiny local newspapers are thriving. As I understand it, they mostly report high school sports, local political news. obituaries, and police reports. These suburban and small town papers usually publish once a week, and often distributed free. Small business advertising seems to be a huge revenue source for them." Isn't this how print editions began in this country? Have they come full circle? The day the major paper goes out of business, I'm celebrating. I remember an interview by a centrist of a local reporter and they all think alike. I agree with the above commentator, that a small local events only paper that is free might work. But really with 7" wifi enabled ereaders already available in the $30 dollar range even that is going to get difficult.